There is an Annie Hall feel, with matching color and fabric ties and shirts, paired with chinos for a masculine look. 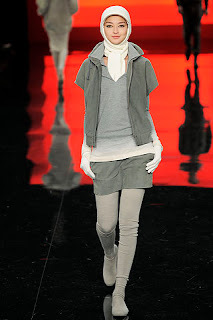 There are also feminine, comfortably chic looks, including knit jumpsuits and double faced wool coats. Vests, cardigans, turtlenecks and hoodies are layered on, adding extra warmth to the wool-over-wool pieces. A neutral palette of beige, off-white and grey also include deep blues and greens, as well as mustard yellow. The monochromatic styling of the looks is modern and sophisticated, very different from the young, sporty style of Lacoste. The cozy new looks for fall would fit nicely into the work wardrobe, with soft hues exuding a relaxed, upbeat feel.